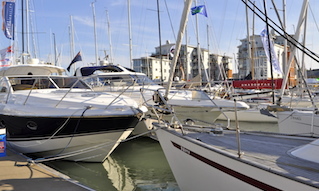 Cowes welcomes over 50,000 visiting craft during the season from March to October, and has berths suitable for all sizes and types of vessel. There are a large number of visitor swinging moorings and river pontoons available both in Cowes Harbour and upstream on the River Medina. 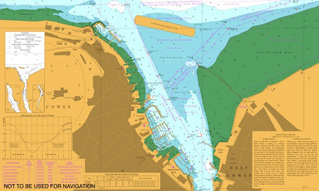 The Cowes Harbour Mooring Location Chartlet gives an overview of all Cowes Harbour Commission (CHC) run mooring options. 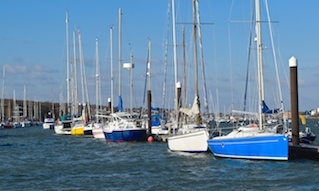 All Marinas in Cowes Harbour have facilities for visiting craft, namely Shepards Wharf Marina, Cowes Yacht Haven, East Cowes Marina, and Island Harbour Marina, which offer a full range of services and amenities suitable for yacht racing events, or rallies, and cater also to the needs of the cruising sailor and powerboater. 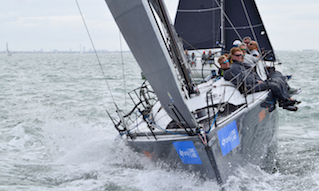 Tariffs applying to Berths for Visitors are shown in this section, but note that special rates apply with regard to Berthing for Events, during Cowes Week, the Round the Island Race, or for other major events, so it pays to enquire in advance. For river pontoons and swinging moorings, call ‘HM1’ on VHF Channel 69. For marinas, call on Channel 80. During busy periods you may well need to ‘raft up’ and when possible, you should always hail the vessel you intend to moor alongside and request permission, as a courtesy. Frequent Water Taxis provide essential links to Cowes and East Cowes, around the Harbour and to all parts of the River Medina. 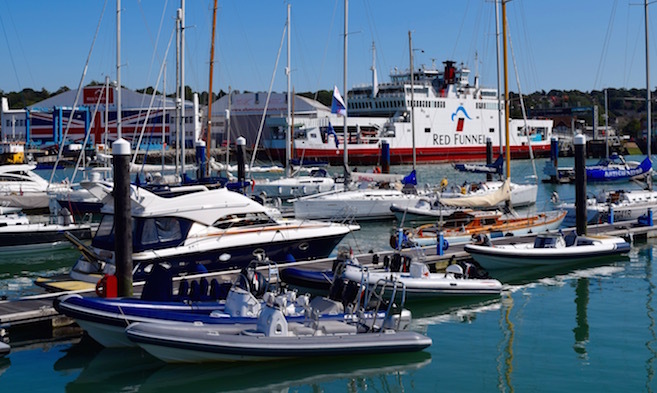 Cowes Harbour is one of the most visited ports on the south coast of England and provides excellent boating facilities and services in the harbour and on the River Medina through the many boatyards, marinas, and marine services operators. There are also several Slipways and Public Landings for launching and recovering small boats. Fresh water is available from all the marinas, and at Trinity Landing. Marinas provide facilities for garbage originating from the boats using their berths. Boats moored in the River Medina or at anchor should retain garbage on board until berthed alongside, or take it ashore to facilities situated adjacent to public landings. Using the river to dispose of rubbish of any kind is illegal. CHC would like to encourage all harbour users and visiting yachtsmen to Cowes to make use of Shepards Wharf Marina’s pump out facility for boats, which is available and free to use all year round. The pump out berth, for use by any boat (with prior notice), is located on the south pontoon at Shepards Wharf Marina in Cowes. Please call the marina on tel: 01983 297821 to arrange access and the marina staff will be glad to help you. CHC levies no charges for the holding tank pump out in order to encourage more sailors and boaters to use the facility. Cowes Harbour Fuels, open seven days a week, is the main facility in Cowes Harbour providing easy access and competitively priced fuel. It is situated on the River Medina, 200m south of the Chain Ferry underneath the large Hammerhead Crane. Tel: 01983 200716. VHF Ch 69. 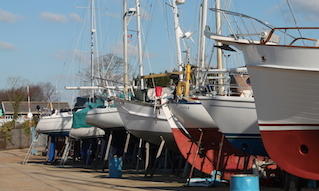 Lallow's Boatyard, 50m south of Cowes Yacht Haven. Tel: 01983 292112. There is a scrubbing berth at Town Quay, adjacent to the Harbour Office. Suitable for vessels up to 10.6m LOA and 2m draft at spring tides and 1.0m draft at neap tides. The Folly Inn scrubbing berth on the River Median is capable of taking vessels up to 10.6m LOA and 1.83m draft at spring tides. Bookings by application to the Folly Harbour Office on Tel: 07884 400046. If you are afloat and have a medical emergency call Solent Coastguard on VHF Ch 16/67. The designated medical emergency landing site is Trinity Landing, off Cowes Parade. Cowes has a Medical Centre at 200 Newport Road, Cowes, PO31 7ER. It is open Monday - Friday from 0800 to 1800 with late opening until 2000 on Mondays and Wednesdays. For appointments Tel: 01983 295251. A&E service is at St Mary’s Hospital, Parkhurst Road, Newport, PO30 5TG. East Cowes Medical Centre is next to Waitrose, in Church Path, East Cowes, PO32 6RP. It is open Monday - Friday from 0800 to 1830 with late opening to 2000 on Mondays. For appointments Tel: 01983 284333. NHS 111: If you live in, or are visiting the Isle of Wight you can call 111 when you need medical help fast, but it isn’t a 999 emergency. You will be assessed, given advice and directed straightaway to the local service that can help you best. That could be A&E, an out of hours doctor, a walk-in centre, community nurse, emergency dentist or a late opening chemist.